This week we both decided some pampering was in order - one of us experienced an organic facial and the other bravely tried a "snail mucus" face mask. Here are the results! So I have to admit that I'm one for trying lots of different things in life when it comes to health, fitness and beauty. I don't feel you can be sure it isn't for you until you've tried it - within reason of course. 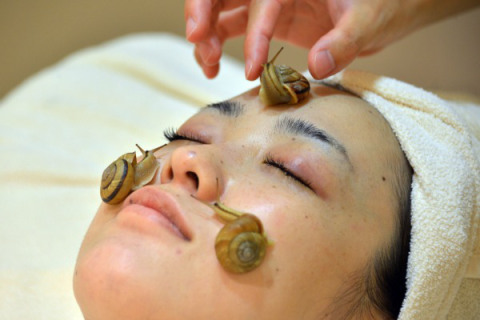 And apparently "within reason" extends to putting snail mucus on my face. I didn't actually know it was snail mucus when I first put it on. My cousin's girlfriend had given my mother a pack of Nature Republic (a Korean brand) face masks as a Christmas gift, and I was eager to give it a go. It wasn't until I had opened the packet, struggled to peel off the mask from its sandwiching plastic sheets, and again struggled to put it on my face, that I realised that it was slimy. Very slimy. It wasn't until this point that I decided to actually look at the packaging of the mask, and discovered "Snail Solution 2,000 Hydrogel Mask Sheet" on the front. I thought "snail" must be Korean for some sort of exotic, purifying elixir. While I did some yoga (which goes to show how well the mask stuck to my face, as it didn't once fall off during downward dog), I took a closer look at the back of the packaging. The English section informed me that the mask sheet contains 1,000 mg of concentrated snail mucus extract. 1,000 mg, I thought. That sounds promisi- wait. What?! Snail mucus extract??? 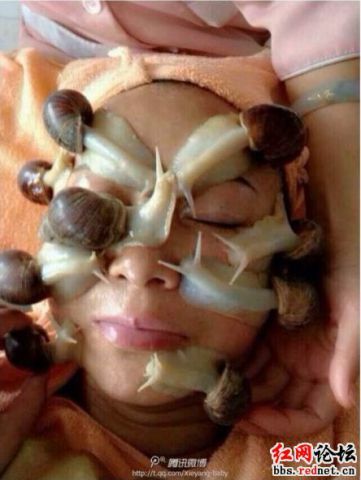 The package informed me that the snails have been raised in a "clean environment", and that the resulting mask has "excellent hydrating and restorative effects with strong adhesion to the skin, leaving the skin smooth and healthy by helping it to recover from the various common skin problems including blemishes, acne scars, flushed skin, a dark and dull complexion, and sagging skin." It definitely did have strong adhesion to the skin, given that my jaw had dropped open by this point but the mask was still in place. And the number of skin ailments it claimed to fix definitely put it in the category of an exotic, purifying elixir. I left the mask on (as instructed) for 20 minutes and discovered that the external side of the mask appeared to continue to be slimy, but when I peeled off the mask, the internal side was fairly dry and had crisscross patterns over it. Assuming that I had put it on the wrong way, I tried to switch sides., but I now suspect that when you leave it on, the slim transfers off onto your skin, leaving that downward side of the mask dry. This picture is just to gross you all out. All I can say is that my skin felt somewhat hydrated afterwards, but surprisingly not oily or sticky. While the cut outs for the eyes are very large, I found that my (sensitive) eyes did get slightly irritated when I readjusted the mask to sit closer to them. Top tip: Speaking of re-adjustment, don't do it. First, if you have nails, you'll easily puncture holes in the mask and end up with chunks of mask in your hair. Secondly, it's actually surprisingly hard to get the mask in the exact spot you want, so you'll probably end up with chunks of mask in your hair and the mask sitting in the exact same position as before. 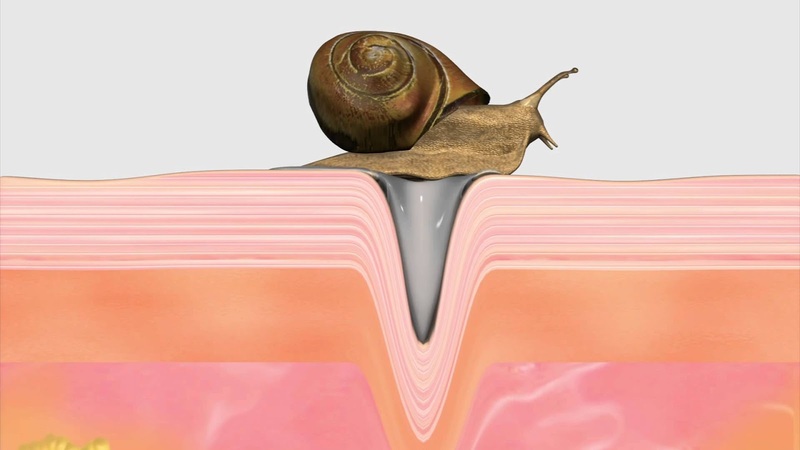 Finally, I spoke to my colleague the following day about how weird the snail mucus concept was. She has probably the best skin I have ever seen on anyone: at a cost of spending an hour and half on it every night. Yes, you read that correctly. An hour and half. Anyway, she was completely unphased by the snail mucus, saying that she had tried it before and it didn't do anything for her - but that the Koreans love it. So apparently it was within reason after all. Having recovered from a rather hormonal week, I re-visited Pure Tincture, which only stocks high quality, eco-friendly, organic skin care products, such as PAI, Suki and OSEA, and also offers organic facials, tailored to you specific skin-care needs. Upon arrival, Helen, proprietor and face therapist, will examine your skin and discuss any concerns you have, before advising on which skin care range and which facial would be most suited. This is perfect for those who, like me, find it difficult to differentiate between treatments. The treatment room is clean and comfortable, and I quickly settled in for 90 minutes of relaxation. All 90 minute facials include tailored facial massage techniques and extractions (if suitable), The highlight was the face, neck and shoulder massage! I also love the fact that Pure Tincture uses products that contain pure, natural, organic or bio-dynamic ingredients. To ensure my skin gets taken care of in between facials, I purchased Suki's balancing facial oil, which smells divine and contains jojoba, hazelnut, borage and blue chamomile. Helen gave me a sample of this after my first visit, and it works wonders to hydrate, brighten and calm my skin throughout the day. Love it! Top Tip: Consider buying a membership package (SGD 600) which can be offset against your facials (90 minutes at SGD 126 for members), otherwise a single 90 minute facial will cost SGD 180.